This was never truer than on Wednesday when three people were shot, allegedly by Whangärei man Quinn Patterson. Tragically, mother and daughter, Wendy and Natanya Campbell were killed. The third was injured, but managed to escape. This is an extremely tragic event and is about as bad as it gets for the staff who attended. I worked in Northland for many years and I know how strong the community is – you will get through this. Our thoughts are particularly with Wendy and Natanya’s families and the injured man. Police will continue to provide support in any way we can to the families and the wider community. I was extremely impressed by the actions of all staff involved in this event, particularly with the AOS members, who despite the presence of an active shooter, formed a human shield around medically trained police staff so they could get to Wendy and Natanya to see if there was anything that could be done. The investigation into this tragedy is ongoing. We will continue to provide updates as they become available. Last Month Detective Inspector Iain Chapman and the Auckland Financial Crime Team received the VISA Law Enforcement Award for their work in preventing serious financial crime that affects people all around the world. The Law Enforcement Award recognises Law Enforcement Agencies within the member region for the work they do in supporting VISA members and stopping criminal activity on VISA issued card and merchant facilities. Earlier this year the Auckland Financial Crime Team apprehended and held an organised criminal syndicate to account which was placing skimming devices on various ATM machines around the world. The New Zealand Bankers Association, along with support from ANZ and Kiwibank, nominated Iain and his team to acknowledge, not only this specific case, but also a large scale fraud event in the Pacific. This award was for Law Enforcement Agencies in New Zealand and Australia and covers a large number of groups, therefore it is a significant win for the Financial Crime Team and NZ Police. On Thursday, I was delighted to present the Meritorious Service Medal (MSM) to Detective Sergeant Steve Nightingale. Steve has been recognised for his outstanding performance, contribution, professionalism and leadership in the CIB over a large number of years. He has worked on many high-profile and complex investigations and achieved outstanding results which have reflected extremely well on Counties Manukau and New Zealand Police. The MSM is the highest award that I can make as Commissioner of Police, and is open to both constabulary and non-constabulary staff. The fact that Steve is just the 13th person to receive it since it was introduced in 2014 says a lot about its prestige, as well as his contribution to Police. I’m sure you all join me in congratulating him on this achievement. Last week a covert operation was terminated that covered Southern and Waikato Police districts. Investigators seized approximately 130 grams of methamphetamine, worth $130,000, and an estimated $80,000 in cash. More importantly, a significant drug supply network was dismantled and this will have ongoing benefits for the whole country. Methamphetamine is a very harmful and highly addictive drug, and it is unfathomable that members of our community even consider experimenting with or continue to use it when they know the serious consequences it can have – not only on them, but their family and wider community. The destruction methamphetamine causes across the community cannot be underestimated. We know methamphetamine and other drug use is a driver of other crimes in the community and violence is a common feature of the methamphetamine supply chain. The people who are engaging in methamphetamine manufacture and supply are targeting vulnerable people in the community, seeking to make money at their expense. They are driving social harm in our communities and Police will continue to take a hard line with these offenders. We know that some of the highest recidivist offending occurs because of people driving unlawfully. Driving offences are often the way young people enter the Justice system. These people are risk to themselves and to other road users so I was impressed to hear about some initiatives happening around the country where our staff have stepped up to help make our roads safer. Northland Police has set up a driver licence initiative at a high school in Kawakawa to help students obtain their licences. The local driver trainer spent time with fourteen students to bring them up to speed. Police worked with Kerikeri AA to accommodate testing the students en masse, and all fourteen passed their learner licence test. The long-term benefits of this initiative will include safer roads, fewer tickets and forbidden drivers, and stronger relationships with youth. Further south, Wellington District staff delivered a one-day multi-agency programme to 20 female prisoners at Arohata Prison on 12 July. Police works with the Council, Fire, Health, and Corrections to break the cycle of recidivist drink-driving as well as other alcohol harm or substance abuse. This is the first time Road Policing has taken the programme to a Corrections facility and with such great feedback received from the partner agencies I’m sure it won’t be the last. A fence at the top of the cliff is better than an ambulance at the bottom. We need all Police staff to ‘think prevention’ during every contact. By ensuring this mindset is at the forefront of everything we do, we will deliver on the intent of ‘Our Business’ - making New Zealand the safest country in the world. I don’t think many of us escaped the cold blast that hit the country last week. There was weather-related chaos all around the country and states of emergency declared in several places. As always happens in these situations, Police is often one of the first emergency services to respond. We can’t say it enough – when the weather is that bad that a state of emergency has been declared, stay home and delay your travel. 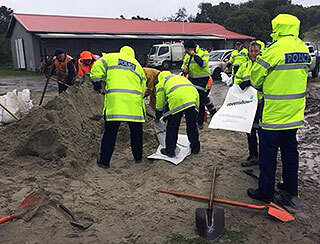 Unfortunately the climate in New Zealand does lend itself to this type of weather at times so be prepared and help your neighbours out. It’s a good idea to get in touch with your neighbours so you can all keep an eye on each other, especially if you have any vulnerable neighbours. This is also great crime prevention advice – if you know your neighbours they are more likely recognise suspicious behaviour and do something about it.